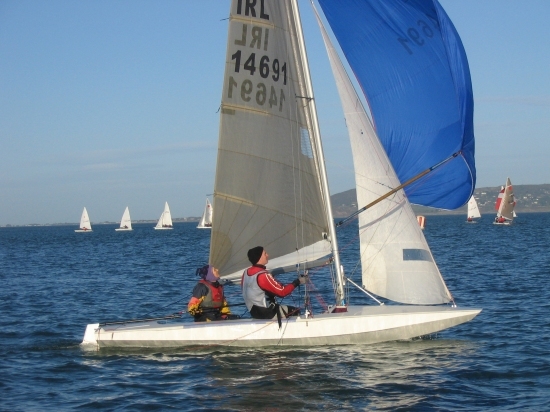 They are the seven Dublin Bay 24 footers (waterline length) that last sailed in September 2004. They had wondrous names: Adastra, Arandora, Euphranzel, Fenestra, Harmony, Perriwinkle, Vandra (sunk off Howth harbour in 1974) and Zephra and I remember seeing them sailing in the Bay. Euphranzel getting a coat of paint in the George. Designed in the mid 1930s, under a commission from a group of Dublin Bay members of the Royal Alfred Yacht Club, yacht designer Alfred Mylne produced the largest one-design yacht in Europe. 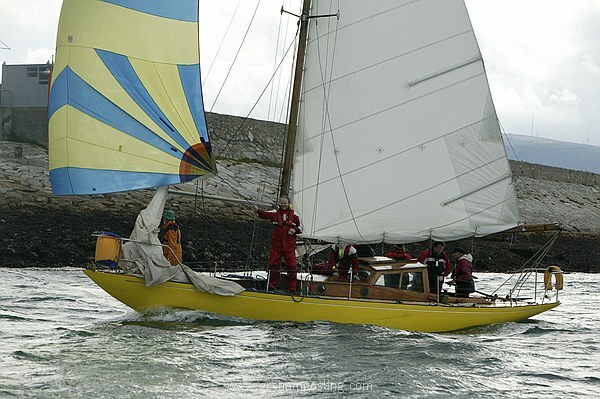 The classic lines prompted one owner to declare it a ”six-metre with a proper amount of beam” and the sea-keeping qualities, particularly downwind in heavy conditions were much admired. Although latterly used as dayboats, some of them raced and cruised offshore in the past, including Fastnet Races, the Northwest coast of Norway & throughout Scotland. Currently, the seven boats are in a restoration yard in Benodet, west France, having been bought by the promoters of the Villefranche Classic Yacht Club. The Villefranche club (a few miles east of Nice in the Med) is a development promoted by a group of Irish sailors / businessmen including Christopher Craig, John Sisk, Michael Cotter, and Ward Woods. Their plans include a pair of refurbished villas (with underground parking for classic cars) and the fleet of boats for day racing. Which they plan to rename “Villefranche 38” (overall length.) I prefer Dublin Bay 24. And Euphranzel is a beautifully melodious name which does not appear in Google, except in relation to the boat. What does the name mean? And speaking of Google, they indexed and returned this posting within four minutes! Another personal best at SB3 Westerns this past weekend. 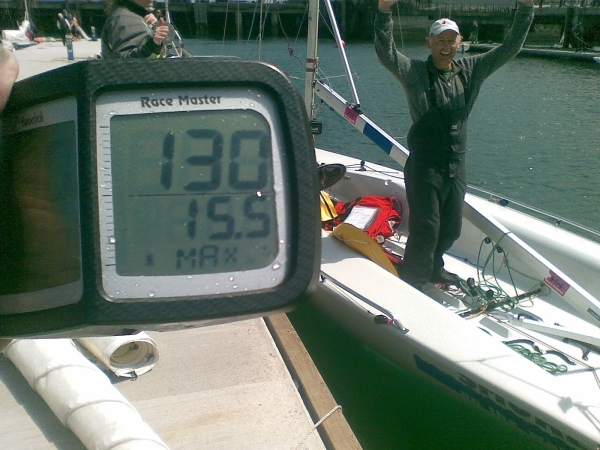 Max speed on a windy Saturday was 17.9 knots! A very pleasant time in the warm sunshine at Dun Laoghaire. 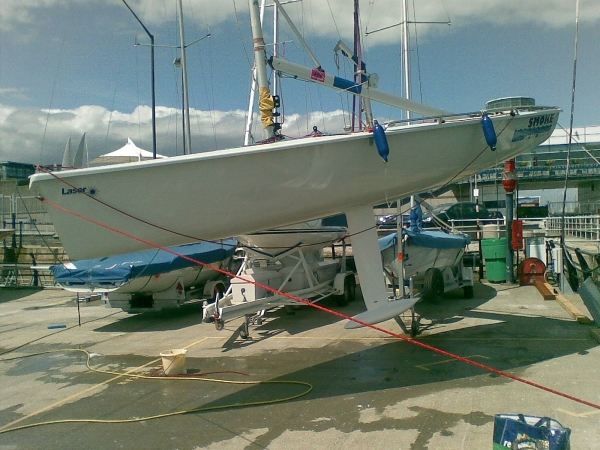 I repaired a few minor dings in the keel and bulb, gave the boat a good wash and then a polish to make her sparkly. A hard day at the office. 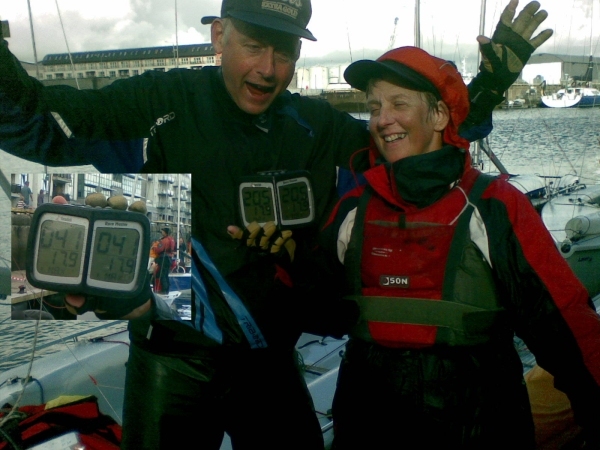 That was our max boat speed yesterday during the RIYC regatta, two races and it was massive! John and Siobhan were great, three big broaches, one trawl, no prizes but all smiles. A day that explains reason why God created sailboats. Here is what the BP oil spill in the Gulf would look like if it had happened in the middle of the Irish Sea. How can they possibly clean it up? What if it happened here? The Google Map overlay is available at the If It Was My Home website. Go there to see the latest size of the spreading spill. This rudder is from a 30 year old David Thomas-designed Quarter Tonner and it’s a bit wet. Wet on the outside is perfectly normal. Wet on the inside is a problem. 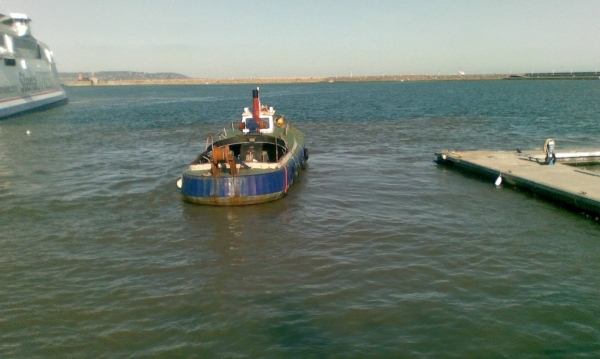 The owner consulted a marine surveyor who suggested a repair would be a very good idea. And so it came into my hands, and leaked all over the back of the car when I took delivery. My plan is to clean the rudder, dry it completely, epoxy and clamp the split trailing edge and then wrap it with lightweight e-glass and epoxy resin. After fairing the cured surface, I’ll primer paint it and return it to owner, ready for antifoul and installation. The Stena fast ferry Lynx III arrived in Dun Laoghaire from Holyhead for the first time this afternoon, a test run before scheduled daily service begins on 15 March. The docking was followed by the sound of angle grinders trying to make the car bridge and the pedestrian bridge fit the ferry. No lorries or buses will be carried. Stena withdrew the much larger Explorer ferry from its once a day service back in November . Powered by aviation gas turbines, she was known as the Big Ugly ‘effing Ferry and stank of kerosene in the harbour since the service’s introduction in April 1996. Apparently, Stena plans to return the Explorer to the route in July and August. It would seem the Royal St. George will lose at least two trots of moorings for the fleet of Squib sailboats to make way for the Lynx ferry, the Little Ugly ‘effing Ferry. The 81 metre long Luffy was built in 1996 by Incat in Australia and travels across the Irish Sea at 38 knots. She banged hard into a pontoon bridge at Holyhead a few weeks ago whilst practising docking. Details here. The vessel arrived at St Michael’s Pier bang on the top of today’s afternoon high tide and her water jets kicked up a tremendous amount of silt as seen below. The boat in the foreground is the George’s barge, used for laying and lifting moorings in the harbour. 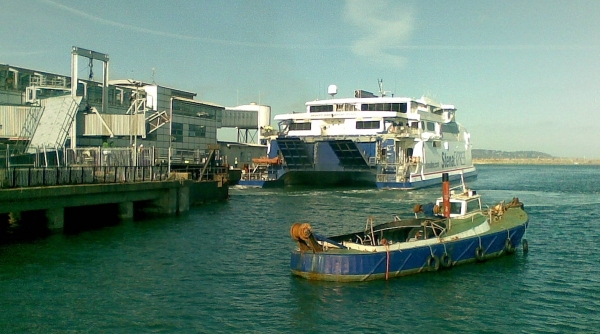 The 35-foot catamaran Lucky Day seized in the €440 million west Cork drug haul on 2 July 2007 is to be auctioned by the Criminal Assets Bureau next month. 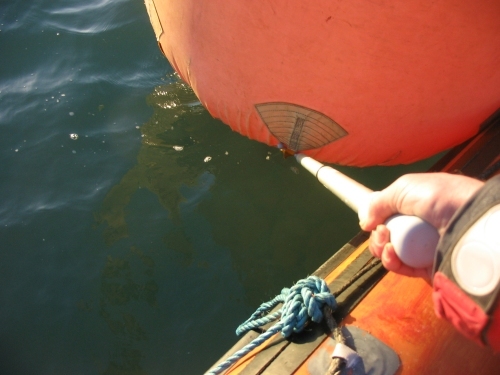 Two rigid inflatables, four outboard engines, two trailers and three 4×4 vehicles used in the botched attempt to smuggle cocaine are also being sold on behalf of the Criminal Assets Bureau by Cork auctioneer Dominic J Daly on March 23rd. 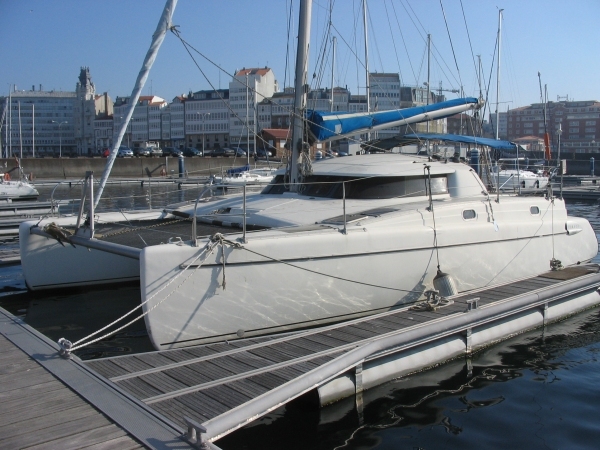 The 13-year-old catamaran was previously maintained by Austrian owners. It is in “very good condition” at a berth in La Coruna, Spain, according to Mr Daly. It was bought for $132,000 over the internet and was described as “in flawless condition” when advertised, with two forward staterooms, one in each hull, queen-size beds in both, two large “heads” or toilets and eight berths in all. The Spanish authorities had a good rummage inside the boat. Here is the main saloon in April 2009. Supposedly tidied up by now. The Irish Sports Council has released details of its €2.65 million high performance grants. That sum will be divided amongst 273 top athletes in 20 different sports. There will be a number of battles amongst the sailors en route to Weymouth for the 2012 Olympics. Ireland will need to qualify as a country for inclusion and then determine a fair method to choose who represents us. Annalise Murphy and Tiffany Brien will go head to head in the Laser Radial, while Star Wars the Re-Run will feature Max Treacy and Anthony Shanks against Peter O’Leary and his yet to be named crew. For the 49er class, double Olympians Ger Owens and Ross Killian (formerly in the 470 class) will square up against Matt McGovern and Ryan Seaton, who finished fifth in the silver fleet at the recent Worlds in the Bahamas, while youngsters Ed Butler and Ben Lynch may nip at their transoms. And, I finally acquired a boathook to use when retrieving marks at the end of the race. No more wet and cold fingers!